The next time you head off to a vacation destination, make sure you do more than pack sunnies and swimsuits. Most people make sure to take security measures with their home when leaving on a trip. Everything from holding mail, setting alarms or scheduling lighting timers, can deter theft while you are away. Plus, travelers even leave pricy watches and jewelry at home to prevent hotel theft. Yet, what about internet and cyber theft? 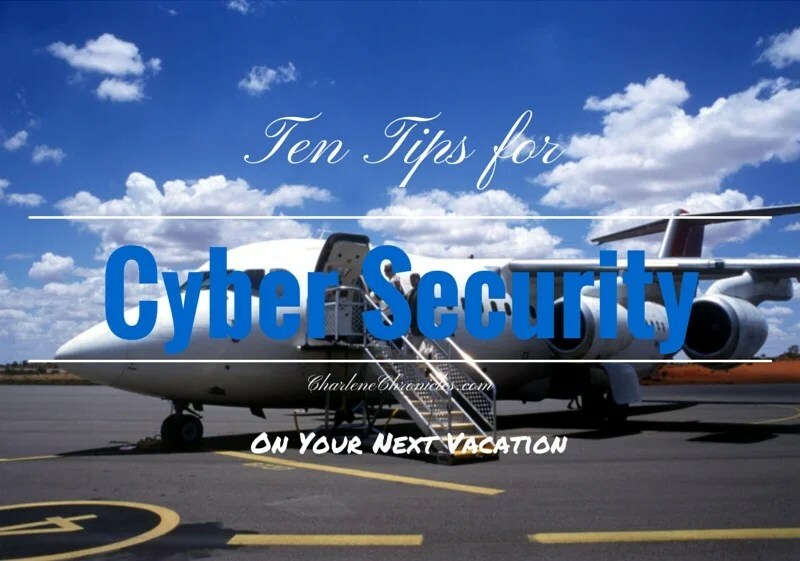 Here are Ten Tips for Internet Security while traveling! The lack of secure Internet access, and copious social media posts, can lead to a big erosion of your security plans. First, stop posting pics on Instagram about your frolics in the ocean. You’ve just told the entire world that you are not at home. Either post later, or add #latergram to every picture to fool folks. Same goes for Facebook and Twitter. Then, while you are printing out your travel itinerary and boarding passes, take a hard look at your computer. Check all devices going on the trip for software updates. Having older software means your computer is not up-to-date with the latest anti-virus initiatives and can leave you vulnerable to hacks. So check for updates. On Mac computers, it is as simple as clicking the Apple Icon and then ‘Software Update’. Other suggestions come from PrivateGiant, a security firm specializing in Internet Security. It suggests removing unnecessary sensitive data from your devices going on the trip, including photos, videos, financial documents and stored passwords. This can save you from heartache and headaches down the road if your devices are breached, stolen or misplaced. Clear your browser cache files and remove saved passwords. If you accidentally connect to an unsecure Wi-Fi network while traveling it makes it harder for cyber stalkers to steal your private information, such as bank access, work emails or photos. Create temporary passwords for sites you plan on accessing while traveling. If you get hacked while traveling, having a temporary “throwaway” password for email or social media will prevent a headache of worry over if your home accounts were compromised. Avoid logging onto free Wi-Fi networks that are unsecure. If you do not have to ask a store or restaurant owner or employee for a password, it isn’t worth saving a few dollars to check your email for free. It could end up costing you a lot more in the long run if a hacker has set up a benign looking “free” network that he or she is using to read everything on your computer. Make sure you are using a secured connection to websites when available. A simple “s” (https:// instead of http:// in your web browser’s URL bar) will protect you from most threats local and remote. According to PrivateGiant, the Electronic Frontier Foundation has created a utility that will automatically use a secure connection for you. Enable two-factor authentication on your important web services (email, social media, etc.) so in the event that someone does gain access to your passwords they need a second code to get in. Guidelines for setting up two-factor authentication can be found here. For additional security when using a Wi-Fi network at a hotel or airport, consider using a VPN on your laptop. A VPN creates an encrypted connection to a third-party server, and all your Internet traffic is routed through that server. Snoopers on the network will only see encrypted data. Switch off the wireless connection on your phone, tablet and laptop when they are not in use. By keeping the connection off you are taking another step in protecting your digital identity, by preventing an opportunity for criminals to automatically connect to your device on an open network without you ever knowing what happened. Plus, it will give you that vacation you are truly looking for.